A sound sales process serves as a template for effective selling while also enabling better personalization. In this post, we show you how it’s done. When business experts discuss an organization’s “sales process,” they often refer to the overarching strategy that sales leaders provide to sales reps. Defining the sales process is an important step for organizations to take, but research published in the TOPO Sales Benchmark notes that 59 percent of organizations don’t have such a strategy in place. Regardless of whether your sales leaders have taken the initiative to build a sales process, individual salespeople are fully capable of developing this process to guide their own selling strategy while demonstrating its value to higher-ups. Even on a small scale, this process can inspire more effective and efficient selling that distinguishes your sales approach while allowing for the personalization that modern buyers expect. In this post, we’ve put together a guide to help you build this process in a way that drives repeatable success over time. 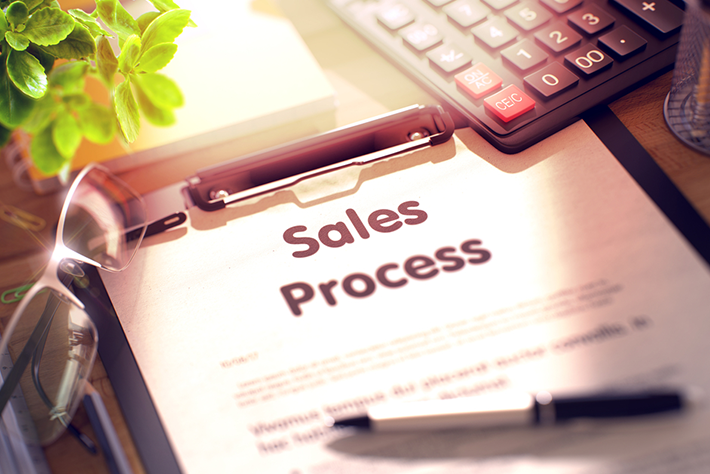 First, it’s important to have a clear understanding of what a sales process is. Your sales process is the step-by-step approach you use when attempting to turn a prospect into a customer. This is similar to a sales funnel, except that the funnel speaks more to the prospect’s location in the customer journey, whereas the sales process is a bolted-down approach used to guide your selling strategy. Think of the sales process as a template you can use for each individual prospect – a set of customizable best practices for guiding sales prospects through the various stages of your sales pipeline. When you develop your sales process, your goal is to use your track record of success with past sales to outline a series of steps you can take to maximize your potential to close the current sale. Avoid the temptation to tackle everything up front – leave some room for the art of selling. Otherwise you’ll inundate your sales process with cumbersome details. Instead, start with a dead-simple framework. Keep in mind that the sales process isn’t a universal prescription. While one process works for some sales teams, your unique strengths and challenges will determine the steps in your approach. A benefit of the sales process is that it allows you to build an approach that plays to your strengths, so don’t settle for someone else’s standardized process. Instead, use your own background and insights to create an approach that works best for you. In general, the steps in your sales process will help you prospect with greater efficiency, initiate contact, get to know the prospect’s needs and desires in greater detail, and convince qualified prospects that what you sell is the best option for addressing their points of concern. At each stage, however, you need to be able to do two things: Differentiate yourself from your competition, and establish your credibility. If you can’t do this at every stage of the process, your prospects won’t give you the time of day. They need to be confident in you as a salesperson, and that can be addressed through the things you say (both in person and online) and other visible markers of credibility. Just as you research your prospects, your prospects will research you. That’s why it’s critical to have a strong, comprehensive LinkedIn profile, providing prospects with a credible, accessible outlet for vetting your background and experience. By taking time to develop your LinkedIn profile, you build credibility into your digital presence that greases the wheels for every future interaction. Additionally, if you’re reaching out to these prospects via LinkedIn, they will likely check out your profile before deciding whether to respond. This credibility will work in your favor when combined with a well-crafted attempt to connect. Whether via InMail or other communication channels, the step where you connect with your prospect should quickly convey what sets you and your company apart from your competition. If your sales process can accomplish this at every step, you’ll have a much easier time keeping prospects engaged and interested. The next step is making sure that your process is flexible enough to be customized to each sales prospect’s unique situation. A risk of sales process development is that you might make it too rigid and impersonal. Although you are building a template to guide your repeated sales efforts, that template isn’t an invitation to engage prospects with a generic sales strategy. In fact, that’s the opposite of what you want to do. The ideal sales process serves as a template that enables and demands personalization. While that might seem like an oxymoron, it isn’t. A well-designed sales process will make it easy to choose where and how you personalize your approach, building customized selling into every step of the journey, and for every individual prospect. This personalization depends upon a strong CRM solution to manage customer data and guide the use of digital sales assets. CRMs are only as strong as the data within them. If you are more vigilant about logging details regarding your contacts, accounts, and each associated interaction than your peers, then you will have a stronger CRM tool at your disposal. Personalized messaging is great, but other sales content can be customized for the recipient based on their role in an organization, their expressed need for the solutions you sell, and other behavioral and demographic data pulled from your CRM, LinkedIn, and other digital channels. Prospects must feel that you understand their unique situation and are both qualified and determined to solve their problem on terms that work for them. Naturally, more personalization opportunities are created at each successive sales process step. The more you learn about your prospect, the more naturally and effectively you’ll be able to leverage your sales process for a truly personal experience. An established sales process makes it easier to prepare a coordinated approach. Whether you’re working with other salespeople or managing a prospect on your own, your sales process should help you turn strategy into action. This coordination should apply to your communication strategy, which should take advantage of multiple channels to diversify your approach. As Heinz Marketing president Matt Heinz explained to Salesforce, the use of multiple communication channels creates better leverage for the salesperson, providing a more comprehensive view of the client and accelerating the timeline for closing a deal. Your sales process should also prepare you to have pitches or presentations ready to handle any given situation. An example is preparing such a pitch with a prospect to gain an audience with the larger buying committee at a company, thus exposing you to a wider range of contacts and deepening your relationship with the account. As these talks with the prospect and larger buying committee progress, establish an agenda to check off every item on the buying committee’s checklist so that the close can function as a natural byproduct of your sales process: Once every item is addressed, there’s nothing left to do but shake on it. This template of your sales process can also help you identify where and how to place sales assets, such as meeting summaries and objectives to keep the process moving in the right direction. A good sales process will always be action-oriented to avoid stalling out, which increases the risk of losing the prospect. It will also ensure that your communications are always substantive and valuable, and never reckless streams of consciousness that risk being perceived as a waste of time. The work isn’t done when your process has been developed. You’ll have to test it out in the field. Performance metrics and a good CRM will be helpful in this regard, too, providing data evidence of what works and what needs improvement. The optimization of your sales process is, in and of itself, a process. No matter how good of a seller you are today, there’s always a way to become more proficient. Do you know what every sound sales process has in common? They all start with stellar engagement. 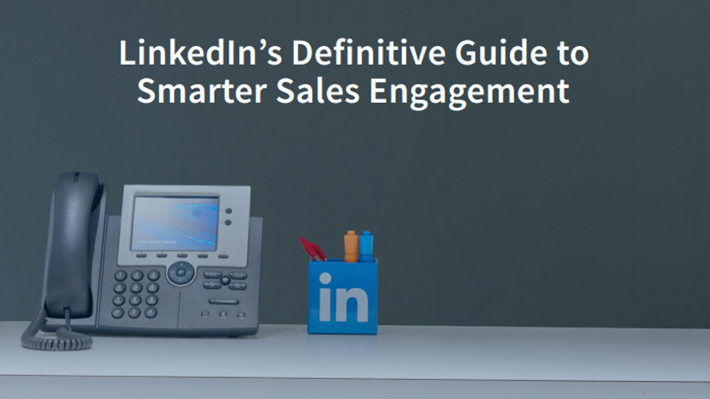 Download LinkedIn’s Definitive Guide to Smarter Social Engagement.